“In this Teaching, thru the knowledge of the Seven Rays, their colors, qualities, actions and which Beings were on each Ray, students were enabled to wield powers of an adept. Bridge to Freedom – ‘THE WISDOM OF THE AGES’ – Volume 2 – Ascended Master Kuthumi:. “The sum and substance of this Truth is: To create as God creates, you must STILL YOURSELF and raise your self into a state of consciousness which is ONE with that of the Ascended Host, until your being is impregnated with the Knowledge, the Belief and the Active Realization that there is no power opposed to God; that manifestation must proceed from Cosmic Cause, and you are not an individual separated from God, attempting to draw by human will something from the Cosmic, but that you are the Great Creator Himself – Calm, Serene, Dispassionate, Victorious, with nothing to overcome but merely through the Joy of Creation, invoking the Light Rays, coalescing the electrons and PRECIPITATING the Divine Manifestations! The correct understanding of the God-Power Almighty is essential for the individual who wishes to become the Holy Christ Sprit in action. This fact I would like to impress upon the chela on the path. Energy is man’s to command. Energy becomes power through use, whether in the wielding of a sledge hammer, or the strengthening of the biceps of the arm or in using the God-Power Almighty to build a momentum of Victory in Commanding the Electronic Light to manifest the completed form of fiat or decree. The Law of Balance, also referred to as “The Law of Retribution” and set forth in the old axiom, “As you sow, so shall you reap,” was not intended as a threat of punishment for evil-doers, but as an expression of the mathematical precision of Life – that one must sow the seed of perfection in concise mathematical accuracy and that the reaping will be in exact proportion to the sowing. This Law has been dulled in its potency by the inference that if one casts his bread upon the water, his good will be returned unto him. This is true, of course, but it is a rather haphazard way of living as the “bread” one throws has no definite form, continuity or precision of outline. “I AM,” he projects into the mental form of the desired manifestation the perfect atom contained in the Great Command “I AM” which is the cohesive Power of Love. This way, instead of receiving back miscellaneous ‘loves and fishes,” one becomes Master of Energy and receives back exactly that which he has ordered! The right hand is the direct wiring through which the energy may be catapulted into the appearance world, and when you are conscious of it as the Five-Rayed (Rays 3 – 7) representative of the Holy Spirit you become the Authority of Life when you release that energy through the hand in a Cosmic Fiat. When you study Serapis’s Ray (4th Ray), you will learn that significance of the index finger and why it is so often dignified with the ring of authority. IN THE PRIVACY OF YOUR ROOM, DRAW THAT ENERGY INTO YOUR BODY WITH YOUR LEFT HAND, (UPPER ARM PARALLEL TO THE GROUND – FOREARM VERTICAL, AND HAND CUPPED TO RECEIVE GOD’S BLESSINGS) THEN CATAPULT IT INTO YOUR WORLD WITH YOUR RIGHT HAND, and let us see some definite manifestation through your conscious use of this Law of Life. Let us be through with the “bread pudding” and bring forth now only the Divine Plan. Blessed, Beloved Immortal Threefold Flame of Eternal Truth within my heart – my Beloved Unfed Flame – that Blessed Mother expression of my own Divinity, I ADORE YOU! COME NOW INTO OUTER ACTION IN ANSWER TO MY CALL. ARISE, ARISE, ARISE! Take complete and immediate, and eternal command of all the energies of my entire Being and world. Purify and illumine them, and COMPEL thy perfect balance of Love, Wisdom and Power to rule me and my world all ways in undisputed and undenied AUTHORITY of love’s perfection over everything in my being and world and all I contract forever. I accept this done RIGHT NOW with full power! So help me, beloved Kuthumi and the Ascended Hosts. The first ray – it has a White centre surrounded by ELECTRIC OR brilliant SAPPHIRE BLUE – it represents the First Ray of God’s Will, Strength, Power and Protection. From this Ray we can draw power, the capacity to lead people, and manifest energy to accomplish any constructive service, as well as the Illumined FAITH and PROTECTION of Beloved Archangel Michael & Beloved Faith, and the STRENGTH of Beloved Elohim Hercules Beloved Amazonia. Chohan or Lord of the First Ray is the Ascended Master El Morya, whose retreat is in the etheric octave over Darjeeling, India. The day that this Ray is most predominant on Earth is Sunday. The Second Ray, the Ray of wisdom, perception, discrimination and illumination vibrates in the colour spectrum of GOLDEN YELLOW. It is the focus of illumination, the “illumined action” of God. We can draw inspiration for all educational and ‘religious’ endeavours from this Ray. The Chohan or Lord of the Second Ray is the Ascended Master Dwal Kul and his twin Ray Lady Luk; the Retreat is in the etheric realm over the Grand Teton, Jackson Hole, Wyoming. The Archangel of this Ray is Jophiel & Beloved Constance, and the Elohim in charge of this Ray is Cassiopeia and Minerva. The second Ray day is Monday. The Third Ray is the Ray of The Pure Divine Love of God, the very essence of consummation of Oneness in the Holy Spirit. Tolerance, harmony, compassion and adoration are also attributes of this Ray. 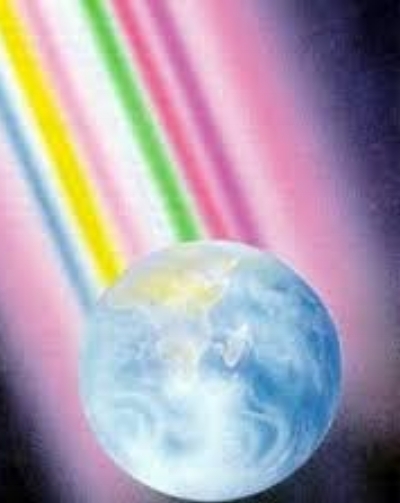 Through this Ray whose spectrum is from the PINK we can draw all the LOVE we require for our altruistic endeavours and for our use in our daily living to bring about tolerance and understanding, as well as the love from the Beloved Archangel Chamuel and Beloved Charity. The great Elohim Orion and Beloved Angelica. The Chohan or Lord of the Third Ray is the Beloved Lady Rowena, who receives her disciples in this retreat, the Chateau de Liberte, which is over southern France. The third Ray day is Tuesday. The Fourth Ray is the Ray of the Purity of God, Resurrection and Ascension, it is ultimately our way back home; it’s FLAME IS PURE WHITE. Like all the Flames, this White Flame is intelligent and can be called into action to ‘Ascend’ any distressing condition in our outer world to be resurrected into a state of peace, happiness and harmony. The colour white embodies all of the rays; and therefore, ultimately, the disciplines of each of the seven rays, bringing one to this doorway, to the ascension, the soul’s eternal liberation. We can draw from this band inspiration as artists, sculptors, writers, architects, as well as the limitless help to accelerate our way back home. The Chohan or Lord of the Fourth Ray is the Ascended Master Serapis Bey, whose retreat is the Ascension Temple in the etheric plane over Luxor, Egypt and a Mighty focus is now above Long Island NY. The Archangel is Gabriel and Beloved Archaii Hope, we can call on him to assist us to hold the immaculate concept and we can call to the great Elohim, Purity and Beloved Lady Astrea, to help us maintain purity in our lives, Elohim Purity, also known as ‘Clair’. The day is Wednesday. The Fifth Ray is the GREEN RAY of Truth, Healing, Concentration and Consecration and the Science of God. It is a ray of abundance, which vibrates in the colour spectrum as Light bright emerald green. Scientists, doctors, healers, mathematicians and musicians draw from this ray in their pursuit of scientific mastery of the self and of the planes of Spirit and matter on this Ray. This they do this through a quest for truth in every discipline, including the healing arts. The fifth Ray is the means whereby those who require the logic of the logos can find their way back to the Christ consciousness, back to their God-design or Divine plan. The Chohan or Lord of the Fifth Ray is the Ascended Master Hilarion, whose retreat is the Temple of Truth on the etheric plane over the island of Crete. The Archangel is Raphael & Beloved Mother Mary and the Elohim is Vista (Cyclopea) and Lady Crystal. The day is Thursday. The Sixth Ray is the Ray of John the Beloved - formerly Beloved Ascended Lady Master Nada, and before that, the Beloved Master Jesus, who has now taken the office of World Teacher together with Lord Kuthumi. This Ray represents the attributes of Peace, Grace and the Ministration of God. The Sixth Ray has a frequency in the spectrum of RUBY AND GOLD. This Ray is the path of those who minister in the energies of peace to the evolutions of earth as counsellors and comforters in every walk of life. From this Ray we draw forth our COMFORT and PEACE. The inner vow of those who serve on this Ray is “I AM my brother’s keeper,” and their soul motto is “He that would be great among you, let him be the servant of all.” Lady Nada is aligned with Temple of Illumination located over lake Titicaca in Peru, South America. Beloved Nada achieved her Ascension seven hundred years before Jesus, and has built up a tremendous momentum in the use of the Pink Flame of Divine Love. She is Hierarch of the Temple of Transfiguration in the etheric above Mt Meru Tanzania. The Archangel of the sixth Ray is Uriel, and the Elohim is Peace (Tranquillity). The day is Friday. The Seventh Ray, which has a frequency on the spectrum of Violet, is the ray of Freedom, Invocation, Mercy, Rhythm, Purification and Transmutation, and the Forgiveness of God through the alchemy of the Violet Fire of Mercy. It is the way of freedom of the soul, and through the use of this Violet Fire we will achieve our Ascension. From this band we draw the Violet Consuming Fire of forgiveness to purify others and ourselves. Beloved Saint Germain, who is known as the ‘God of Freedom’ to the earth, is the Master or Chohan of this Ray, which is now the predominate Ray for the next 2000 years. Saint Germain has retreats both in Europe over Transylvania, and in the Cave of Symbols in Table Mountain of the Grand Teton Range, Wyoming and at Mount Shasta, California. The Archangel of this Ray is Zadkiel &Beloved Amethyst, and the Elohim is Lord Arcturus & Holy Diana. The day is Saturday.